Agriox is a revolutionary time released aerobic aeration conditioning product for soils and soil moisture providing critical life sustaining oxygen to microorganisms. Agriox’s slow release of oxygen promotes overall soil health secondary to aerobic ecological sustainability in an environmentally proactive way. The increase in soil oxygen allows for reduction of fertilizers, fungicides and pesticides due to increased plant sustainability making being environmentally friendly affordable. Most of all, Agriox soil oxygen makes sense! How important is oxygen in soils? Ask yourself, How long can you live without food? How long can you live without water? How long can you live without oxygen? Three similar questions, yet three very distinct answers. How would this planet change if you took away this one element? About two thirds of your body and nine tenths of water is oxygen. Oxygen may be the single most important element on this planet for aerobic sustainability. Yet this elementary while fundamental variable is more often than not overlooked. 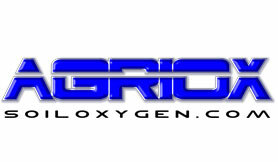 Being one of a kind, Agriox is a time released source to surrounding soils of the life giving element oxygen. It keeps your soils living in harmony. How Agriox it works to aerate soils? Agriox’s slow oxygen release process is essential in the root zone for water and nutrient absorption during photosynthesis. Plants metabolize macro and micronutrients, as well as enzymes, hormones, organic acids and other beneficial components that fuel growth. Plant friendly aerobic (oxygen loving) microbes MUST have a constant supply of oxygen in order to survive and flourish. Unfortunately, because of pollution from over fertilization, pesticides and other chemical compounds typically used in “reacting” to poor plant and soil health, oxygen is more limited than that of Carbon Dioxide. Without a good supply of oxygen, anaerobic microbes explode in population, thus leading to a host of problems including nutrient deficiencies, disease, low crop yields, etc. This in turn leads to the “reaction” of more fertilizer (pollution), more pesticides (pollution) and more chemical (pollution), hence the cycle goes on and on. Agriox is a holistic and fundamental approach to extremely healthy soils and plants. In lieu of Agriox’s slow release oxygen process, the oxygen levels in the soil increase aerobic soil health, thus reducing possibility of nutrient toxicity secondary to the overabundance of Carbon Dioxide. In heavily laden organic soils, Agriox can provide a source of oxygen and improve hydraulic conductivity, permitting more efficient movement of nutrients, water and more oxygen through the soil. Agriox treated soils show increased total microbial populations and species diversity. Increasing species diversity suggests the ability to degrade a wider range of plant nutrients and chemical contaminants that are found in the soil profile thus establishing proactive environmental remediation and sustainability. Agriox’s ability to create and sustain aerobic ecologies in the soil profile is changing the way agricultural professionasl manage there soils and crops. It is a “must have” for healthy soil and plant sustainability.